The Society of Information Displays (SID) expo that is going on at the moment, is the gift that keeps on giving when it comes to the future of mobile, VR, automotive, and all other kinds of screens, and, needless to say, it's Samsung and LG at the forefront of the show, and we don't mean as holograms only, as shown by LG above. 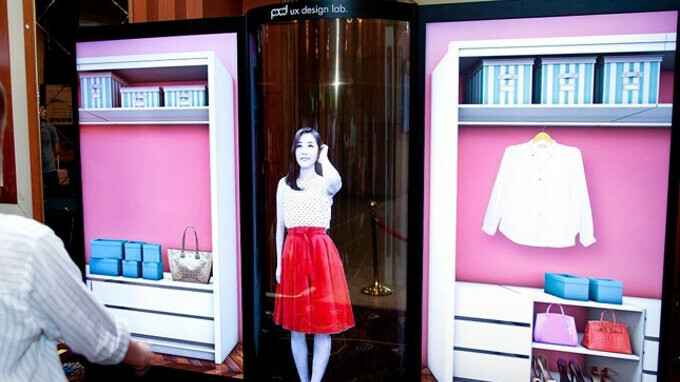 LG Display, for instance, publicly showcased for the first time its virtual reality display that has... Google as a development partner. The fun part is that the 4.3" 3840x4800 pixels screen is of the OLED variety, and, returning 1443 pixels per inch, has the highest pixel density of any OLED screen so far, apart from some micro OLED displays. It is not a flexible screen built on a plastic, instead of glass substrate, like on some curved Galaxy phones you might know and love, but with this resolution, and a 120Hz refresh, the new 4.3" panels might be destined to go into a new Daydream VR contraption. Samsung, in its turn, may be giving up on the Gear VR concept that needs a Galaxy phone to function, or spruce it up significantly, depending on how you look at it. And look at it you shall through Samsung Display's new specialized VR panels, shown at SID. The flagship screen is a 2.43" endeavor with an impressive 3840x2160 (1200 PPI) resolution, 250 nits brightness, and 120 Hz refresh - all the markings of a standalone virtual reality product that won't need your puny phone display with its "lowly" QHD resolution to function. The other two panels dedicated for VR applications that Samsung showed are a 3.5" 1440x1600 (616 PPI) 90Hz piece, and a smaller, 3.2" 1824x1824 (806 PPI) display. A lot of the other screens that the two Korean giants displayed were meant for automotive applications, including "unbreakable" plastic OLED by Samsung, while LG countered with a sound-emitting and big transparent panels. The future of OLED seems pretty bright, and not only because Apple may have now anointed the technology as the chosen one for of its 2018 iPhones. There are apparently 300+ Apple employees attending the SID expo, a huge jump from just a year ago, indicating the company's increased interest in these new screen technologies, and their applications. I like LG better for VR here but hey Sammy is Sammy right! These screens will should work well with Qualcomm's new XR 1 SoC. Which was released recently, and is specifically designed to work with 4k displays and support 6 dof. Can't wait to see the next gen VR/MR/XR headsets using these displays and SoCs. I am waiting to see if LG has new OLED screen for V35 and V40.